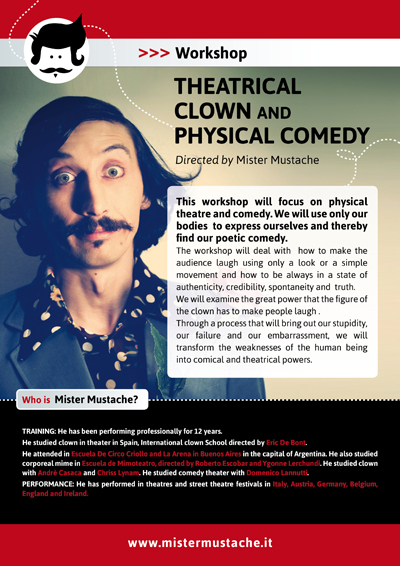 This workshop will focus on physical theatre and comedy. We will use only our bodies to express ourselves and thereby find our poetic comedy. The workshop will deal with how to make the audience laugh using only a look or a simple movement and how to be always in a state of authenticity, credibility, spontaneity and truth. We will examine the great power that the figure of the clown has to make people laugh . Through a process that will bring out our stupidity, our failure and our embarrassment, we will transform the weaknesses of the human being into comical and theatrical powers.